In February of 2012, we merged four prominent Twins blogs into one. It was the start of Twins Daily. We are quite proud of the community of Twins fans that we have established here at Twins Daily. Our forums are busy, filled with generally intelligent, civilized discussion on Twins topics, positive, negative or informative. We encourage you to create your own blog on our site for more discussion. If you’re like us, you’re not just a Minnesota Twins fan. Many of you, presumably, are Minnesota sports fans. We have Monday morning quarterback tendencies and have all had our moments of Vikings disappointment. That’s true even if we were born since the last time the team lost a Super Bowl. Names like Herschel Walker, Mike Lynn, and Gary Anderson cause a reaction inside us. It is the same reaction many Minnesotans still get when they hear the names of Norm Green or Nick Leddy. Minnesota fans love Minnesota sports, at least a couple of them. Tonight, the Minnesota Wild will take the ice in St. Louis for their first game of the 2016-17 season. This should be an exciting season for the Wild. Last spring they fired Mike Yeo. He was replaced by Bruce Boudreau. The 2016-17 roster is a nice combination of veterans like Zach Parise, Ryan Suter and newcomer Eric Staal. They also have a group of 25-and-unders that remain exciting. Names like Mikael Granlund, Jason Zucker, Charlie Coyle, Erik Haula and Nino Neiderreiter need to take a step forward. Two years ago, we launched Wild Xtra with the same goals and the same mission as we have here at Twins Daily. We look to provide quality articles that provoke thought and discussion. We would love to have a intelligent, civil discussion. We want to encourage independent writers to create their own blogs on the site to share their thoughts on the club. The Minnesota Vikings are the NFL’s lone undefeated team as they enter their bye weekend. Even with injuries to their quarterback, future Hall of Fame running back, several offensive linemen and others, the team has played very well. The offense has been all right. The Vikings defense is elite, one of the best in the game. Vikings fans have had reason for optimism in various years over the last decade or so. This year is something different. There is a feeling that this defense can carry the team to the Super Bowl. There is a lot of season remaining for that to be the case, but the team and its players are certainly deserving of its accolades to this point. We launched Vikings Journal a little over two years ago. It has undergone several changes but there is a core of writers each week that provide content. As important, there is a community in the forums that civilly discuss the goings-on with the Vikings and the NFL. Twins Daily, Vikings Journal and Wild Xtra are tied together under the MinnCentric family. If you are registered at Twins Daily, you can use the same Username and Password on the Wild Xtra and Vikings Journal sites. That makes it easy to go from site to site and comment or blog. We would really like to help build those communities. Obviously we appreciate you spending some of your time each day reading and commenting at Twins Daily. But today we want to encourage you to take a couple of minutes of your time to visit Wild Xtra and Vikings Journal. Register your username and spend a few minutes reading the content, and commenting in the forums. Also, if you would like to express your thoughts on the Wild or the purple, start your own blogs. Follow Twins Daily, Wild Xtra and Vikings Journalon Twitter. Like Twins Daily, Wild Xtra and Vikings Journal on Facebook. Give these sites a chance. We really appreciate all of your support despite the losing we have seen from the Twins over the last half-dozen seasons. 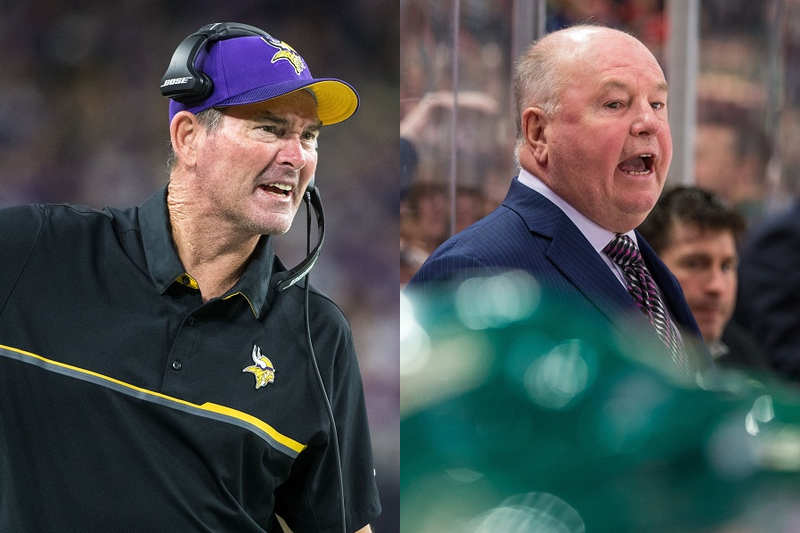 The Minnesota Wild and Minnesota Vikings both have a good chance to make the playoffs and an opportunity to do some special things this season. Hop on the bandwagons and help us grow. Why no love for the Wolves? They are going to be a blast to follow this year! Thanks for all the great work you do on this site. It's my first click in the morning and has brought me much closer to the Twins in the last few years. This is hands down the best community-driven Twins site on the web. The Vikings side could use more activity and it will grow with time. The Wild and Wolves are a bit past my days in Minnesota so I don't follow them, but there is no reason this can't be the place for fans of both. One question. Though users can use their Twins Daily accounts on the other sites, there is still a bit of a registration hoopla one has to do in order to post on sites you didn't initially sign up on. Why not make this completely seamless? You register for one, you can post anywhere. One registration and you are automatically a member of everything on the site. I will certainly be blogging for the Twins and possibly the Vikings in the future. Great thanks to Seth and all the others who made this place an open community where everyone can contribute and express their opinions. I was once a regular on 'another' Twins forum where the comments can get a bit disrespectful. I assumed this was because the site was lightly moderated and simply accepted it as a place where people could freely express themselves. After some time I learned that the people who were disrespectful were all of the moderators. At that point I realized it wasn't a place where people can express themselves at all, but it was a place where the moderators were bullying people. Once I figured that out I left and never came back. Twins Daily is a site where I know this would never happen. Love Twins Daily. My view of Vikings Journal has been that it lacks good content and rarely has enough of it. That isn't helped that the comments sections are rarely entertaining to read - no one making an argument or starting a discussion. Maybe it's due to the basic difference between baseball and football? Baseball's stats make it easier for an everyday fan to make an argument and playing everyday keeps stories going. Football is significantly harder to understand and there's only 16-20 games a year. I think baseball is a much more nuanced game than football. Hitting the cut-off man, a player not properly covering a base, loafing while getting into position, all of these factors can affect the outcome of a baseball game. Football, at least the last time I watched, was about pass, pass again and then pass some more....with the hopes of getting a "completion" via a phantom "pass interference" call. I find football to be boring and predictable. Plus, the players and the on field celebrations for making a first down have become reminiscent of the touchdown celebrations of a decade ago. However, with baseball, I can safely say that even with the hundreds of games I've watched, there will always be something that happens that I've never seen before. To me baseball is a chess match, but a bit faster. And football is a few seconds of action and break, more party like and less thinking. Explains the differences in those game threads. Baseball is a chess match? It is a series of one on one matchups, and doesn't require anywhere near the long term (in game) strategy of chess (or even the NFL, where you disguise coverages, set up later plays with early plays, etc). Thanks for all the kind words in the post (that I erased in the quote out of modesty). The registration isn't as seamless as we would like it to be between the sites, but it's the best we can do for now. It's just technically very tricky to make two separate site use the same security IDs and such and keep them in sync. In fact, if you remember, the original Twins Daily platform that we had until two years ago, the whole reason we switched was because there was just no way to do it with that platform. We had to build this one from the ground up just to have the IDs be able to be used across the platforms. So I appreciate your patience. We will work on that along with some other changes when we have a little more bandwidth. I'm a frequent visitor of Vikings Journal, just to take a look and see what's going on there. But honestly, I don't post much there or visit it the way I do TD. And the reason is simple, just not enough in the way of content or opinion as there is here at TD. It's a quality site with real potential. I'd love to see it grow as big and as busy as this beloved site has become. Disagree on it being boring and predictable - I just think that so much of what is going on is impossible for the lay person to understand. It takes a coach to see what is going on. Take just one part of the two sports: defense. In baseball, there's a basic defensive formation that teams rarely move from. Even when they do, it's pretty simple - they're shifting or they're bringing the infield in. You can explain baseball defense to a 9 year old in 20 minutes pretty readily. And when you're watching, it's easy for an announcer to look at the game and tell us "Okay, The Twins are playing corner infielders in and the middle infield is at double play depth". The average fan has a clear concept of what that means and why they're doing it. A football defensive formation has insane subtleties - where the strong safety lines up changes everything about a play. And that's just one player - add in the middle linebacker and we've got a whole new set of variables. The issue is that the defense shifts things so many times and the action moves quickly enough that we rarely get to even begin to understand what is going on. I'm a pretty decent football fan and my knowledge is basically the difference between the 4-3 and the 3-4, what a double A gap blitz is (but not really any of the variations), press coverage and what the Tampa 2 generally tries to do. None of that allows me to meaningfully discuss the Vikings defense other than to say, "Man, that defense is good. It has good players. It has good schemes. It is good." Cris Collinsworth does a great job on Sunday night football of shedding a bit of light on this - he can't do it every play but when he gets a chance out of a break he can really show you what the teams did. And there's a guy on VJ (can't remember) who breaks down plays with GIFs (this week it was Joseph's effect on running plays) that is pretty good. So good content can be done but it takes someone with a lot of time and knowledge to do so. That's pretty different from baseball. If you give me an hour and a topic, I can put together something pretty meaningful with some decent stats to try to explain something. And people who comment on my hypothetical baseball article can pretty easily find stats or related cases to drive a discussion that reaches 7 pages. Yeah we might get chippy but a lot of it will be very stats and case study drive. Most of the comments on even the good content on VJ is like "Awesome!" or "Great job, super informative!" Because what else can you say? The two sports are just different - it's hard to see the community on TD being transferred to VJ. And that's different than Twins Daily in what way☺? Three new articles on Wild Xtra today. Check them out and add some comments. We're all Twins fans but not necessarily all Viking/Wild fans. I don't really have any more interest in the Vikings than any other NFL team and the only interest I have in the Wild is hoping the Jets beat their sorry asses when they play each other.